Ragwort is highly toxic even after drying in hay when it tastes better! The idea that that rabbits won’t eat a plant that is bad for them simply doesn’t make sense. They learn eating habits in the wild from older warren members. In captivity they are offered a fairly limited variety of plants to eat and they will generally be cautious about trying new foods, but make no mistake, unless it tastes bad to them, if it’s green they are likely to eat it! Happily some very toxic plants do taste awful, ragwort for example, though it loses some of its nasty taste when dried in hay. Unfortunately it loses none of its toxicity and so is much more dangerous if it has been included in hay, as it is more likely to be eaten. It would be unusual for a rabbit to become obviously ill immediately after eating a toxic plant. Many have an effect that builds up in the organs over time. This is a huge problem because once symptoms do show, it’s too late to do anything about it. All house plants should be considered toxic. There is such a huge variety it’s impossible to list them all. Few are safe, and it’s far better to consider them all dangerous and not to allow your rabbits to eat any of them. Keep house plants high up where your rabbits can’t reach them, and if possible, in rooms your rabbits don’t go into. If leaves are about to drop where your rabbits can get to them, snip them off and dispose of them. In the garden, the scope for toxic plants is fairly wide in our climate. Favourites such as anything growing from a bulb – snowdrops, hyacinths (including grape hyacinths), bluebells, crocuses, daffodils, tulips and any other bulb-grown plant should be kept out of areas where rabbits graze. Likewise buttercups, foxgloves, primrose, delphiniums/larkspur, columbine (aquilegia) hellebore, comfrey, poppy, periwinkle, monkshood, nightshade, ivy, privet, holly and yew are all reasonably common garden plants and all are toxic. If you have these growing, either remove them or else ensure your rabbits cannot get to them. When out foraging, there are several plants you need to avoid. Foxgloves, poppy, ivy, buttercups, bluebells and nightshade have already been mentioned, and so has ragwort. Ragwort is a biennial. This means it has a two year life cycle and its appearance is different in each year. 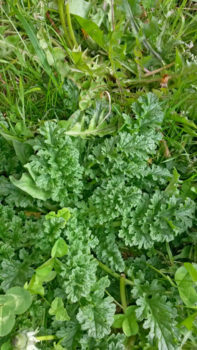 In the first year it is low-growing in florets, with dull, mid-green, crinkly leaves. In the second year it grows taller and has florets of bright yellow daisy-like flowers. It’s equally poisonous in both forms and must be strictly avoided. There are two types of nightshade, Woody Nightshade – more attractive, small purple flowers and bright red berries, and Deadly Nightshade, red flowers, orange berries. Both are toxic but the second more so. Also toxic and not to be fed to rabbits are arum, bryony and hemlock. Unfortunately hemlock is easily confused with cow parsley, which rabbits enjoy very much. Look at the stems. Hemlock has purply/pinkish spots on the stems, shinier leaves than cow parsley and is a brighter green. If in doubt leave it. Hemlock causes a horrible death very quickly after being eaten. Other plants to leave when foraging are Aconite, Celandine, Corncockle, Cowslip, Dock, Fool’s Parsley, Henbane, Hedge Garlic, Ivy, Spurge, Traveller’s Joy, Tree Lupin, Wild Garlic and Wood Sorrel. Our book Foraging for Rabbits is illustrated and very helpful on this subject, going into greater detail. There is also some very useful information on all the plants mentioned at the poison garden.